We studied the frequency, severity, and clinical correlations of cerebral amyloid angiopathy (CAA) in 117 CERAD subjects with autopsy-confirmed AD. Eighty-three percent showed at least a mild degree of amyloid angiopathy. Thirty of 117 brains (25.6%) showed moderate to severe CAA affecting the cerebral vessels in one or more cortical regions. These brains also showed a significantly higher frequency of hemorrhages or ischemic lesions than those of subjects with little or no amyloid angiopathy (43.3% versus 23.0%; odds ratio = 2.6, 95% CI = 1.1 to 6.2). High CAA scores also correlated with the presence of cerebral arteriosclerosis and with older age at onset of dementia. Our findings suggest that factors contributing to non-AD-related vascular pathology (e.g., atherosclerosis) may play a role in amyloid deposition in cerebral vessels in AD. Hemorrhages and ischemic lesions in the parenchyma of the brain are relatively frequent in subjects with AD and may confound clinical-neuropathologic correlations, thus leading to a diagnosis of "mixed'' dementia in as many as 30% of cases. [15-17] The presence of CAA in subjects with and without AD increases the risk of stroke caused by hemorrhages [18,19] and by cerebral infarction. [10,12,20] Subjects with a mutation at codon 692 of the amyloid precursor protein gene may present clinically with hemorrhagic stroke, Alzheimer-like dementia, or both. These findings raise questions regarding the contribution of CAA to the clinical and neuropathologic manifestations of AD (e.g., the occurrence of stroke, the rate of cognitive decline, and the presence of cerebral vascular lesions). To address these questions, we examined the brains of 117 patients enrolled in a standardized, multicenter, prospective study of AD, the Consortium to Establish a Registry for Alzheimer's Disease (CERAD). The present paper presents our findings. Patient selection and clinical information. All patients met previously published clinical and neuropathologic criteria for AD. [22,23] Data were obtained on age at onset of dementia, history of stroke or transient cerebral ischemic attacks, and history of hypertension. Age at death and age at onset of symptoms of dementia were used to estimate duration of disease. Brains were fixed and stained according to local protocols at each CERAD site. The neuropathologic diagnosis of AD was made using CERAD criteria. The presence and severity of amyloid angiopathy was rated semiquantitatively in the parenchymal and meningeal vessels in five cerebral regions: hippocampus; entorhinal cortex; and midfrontal, superior/midtemporal, and parietal neocortex. The severity of CAA was rated on the following scale: 0, none; 1, sparse or mild; 2, moderate; 3, frequent or severe. The CERAD neuropathologists at each site were asked to rate the "average'' or overall degree of vascular amyloid present in each region rather than to score amyloid angiopathy on the basis of the most severe changes observed. Specific staining techniques also varied at each site. A recent survey of 19 CERAD centers showed that 9 (47.4%) used Congo red staining, 7 (36.8%) used Thioflavin S, and 13 (68.4%) used beta amyloid immunostaining (A. Heyman, personal communication). The CAA scores were analyzed in two different ways to avoid biases caused by sampling error or skewing of the rating distributions. First, an overall mean CAA severity score was calculated by averaging the semiquantitative ratings over the five cerebral regions sampled for each subject. The overall CAA score was used as a continuous variable in some analyses. It was also used to define low (score < 1) and high (score >or=to 1) CAA groups. A second method used the highest score among the five regions sampled to define no or sparse versus moderate to severe CAA groups. The latter measure reduces biases introduced by the inclusion of some regions in which CAA was relatively infrequent. The two analytic methods yielded comparable results, and, except where specifically noted, we report only those that used the average CAA score across the five regions. Atherosclerosis in large vessels was rated as none/mild or moderate/severe. Arteriosclerosis and arteriolar sclerosis were designated as being present or absent. Parenchymal cerebrovascular lesions were ascertained by gross and microscopic examination. After fixation and gross inspection, coronal brain slices were examined for evidence of vascular lesions and other neuropathology. The location, size, and age of infarcts and hemorrhages were noted. Location was coded according to vascular distribution (territories of the middle, anterior, or posterior cerebral or vertibrobasilar arteries). The standard protocol called for microscopic analysis of sections from the midfrontal gyrus, superior and middle temporal gyri, inferior parietal lobule, anterior cingulate cortex, hippocampus, entorhinal cortex, and midbrain, including the substantia nigra. The neuropathologists examined sections from additional regions of the brain, as warranted by gross findings. Microinfarcts not grossly visible and lacunes were also noted. Patients were classified in the following categories, based on the presence of any parenchymatous vascular lesions: parenchymal hemorrhage, one or more grossly visible infarctions in the distribution of a major cerebral vessel, microscopic cortical infarcts only, other vascular lesions (e.g., lacunes or cases for which the type of lesion was not specified), and no vascular lesions. For purposes of analysis, these categories were mutually exclusive. For example, if a brain showed both hemorrhages and microinfarcts, it was included only in the hemorrhage group. This was done to avoid artificially inflating the sample by counting a single case in more than one lesion category. t-tests were used to compare group means for continuous variables, and chi-square was used for categorical data. Logistic regression was used for computation of odds ratios and confidence intervals for categorical data and ANOVA with post-hoc t-tests for group comparisons involving continuous dependent variables. Analyses were performed using SPSS for Windows software. Complete clinical and neuropathologic data were available for all 117 patients. All subjects had clinical manifestations of dementia of the Alzheimer's type, based on CERAD diagnostic criteria. The clinical diagnosis was probable AD in 107 subjects and possible AD in 10. A CERAD neuropathologic diagnosis of definite AD was assigned in 106 subjects, probable AD in 6 subjects, and possible AD in 5 subjects. There were 42 women and 75 men. The mean age at onset of symptoms of AD was 68.9 +/- 8.7 years (SD; range 51 to 88); 36 subjects had an age at onset less than 65 years. The mean duration of symptoms before death was 7.5 +/- 3.7 years (range 2 to 20). Ninety-seven brains (82.9%) showed some evidence of CAA (i.e., sparse, moderate, or severe) in parenchymal or leptomeningeal vessels of at least one cortical section. Thirty brains (25.6%) had moderate to severe degrees of amyloid angiopathy in one or more of the five areas sampled, according to the CERAD standardized protocol. Parenchymal and meningeal CAA scores were highly intercorrelated (Pearson r = 0.87; P < 0.0001), and additional analyses are reported here only for the parenchymal CAA score. Of the five standard areas, the most common site for any degree of parenchymal CAA was midfrontal cortex (59.5%), followed by inferior temporal (40.7%), superior-midtemporal (34.8%), entorhinal (16.8%), and hippocampal cortex (13.0%). Occipital cortex was not part of the standard sampling protocol; however, in the 67 subjects recorded, CAA was commonly observed in this location (55%) and was moderate to severe in 30% of subjects. (Table 1) shows the characteristics of subjects with low (score < 1) and high (score >or=to 1) overall parenchymal CAA ratings. The estimated mean age at onset of dementia was significantly greater in subjects with high CAA scores than in those with low CAA scores. The estimated duration of AD, however, did not differ in the two groups. A history of hypertension was obtained in 25 subjects (21.5%). There was a trend for high CAA scores to be associated with hypertension (0.05 < p < 0.10). Thirteen subjects had a history of stroke or transient cerebral ischemic attacks, and 4 of these (30.8%) had high CAA scores. The degree of CAA was compared with the severity of the clinical manifestations of dementia, based on the Clinical Dementia Rating (CDR) scale. Among the 85 patients for whom CDR scores were obtained within 1 year of death, no significant association was observed between severity of dementia, according to this measure, and the degree of cerebral amyloid angiopathy (trend chi-square; p > 0.10). (Table 1) also compares the frequency of arteriosclerotic disease of the cerebral vessels to low or high CAA scores. There is a clear relationship of increased CAA severity to atherosclerosis of large cerebral vessels and to arteriosclerosis affecting smaller penetrating branches. Thirty-three brains of 117 patients (28%) showed hemorrhages or ischemic lesions in the parenchyma at autopsy. All vascular lesions were judged to be "old'' (i.e., occurring months to years before death). In six brains (18%), hemorrhages were found with or without accompanying ischemic lesions. Of the remaining 27 patients, seven brains had gross infarcts, 12 had microinfarcts only, and the remaining 8 had other vascular lesions, such as multiple lacunes, microinfarcts, or infarcts in various combinations. Of the six patients with hemorrhages, only one had a history of hypertension and two others had a history of stroke or cerebral TIA. Of the 27 subjects with ischemic lesions only at autopsy, 11 had a history of hypertension and 4 had a history of stroke or TIA. Thus, only 6 (18%) of 33 patients with vascular lesions of any type had a history of stroke or TIA, compared with 7 of 84 cases (8.3%) without vascular lesions (odds ratio 2.4; 95% CI, 0.75 to 7.92; p = NS). The relationship between the presence of vascular lesions in the brain and the severity of CAA was examined in two ways. Vascular lesions were more frequent in brains with moderate to severe CAA in one or more cortical regions (13/30 brains [43%]) than in brains with no or sparse CAA (20/87 [23%]) (odds ratio 2.6; 95% CI, 1.1 to 6.2). Furthermore, the mean overall parenchymal CAA score for brains with vascular lesions was 0.69 +/- 0.69 compared with 0.42 +/- 0.48 for brains without vascular lesions (t = 2.41; p = 0.018). Specific types of vascular lesions in the brain were associated with more severe CAA. 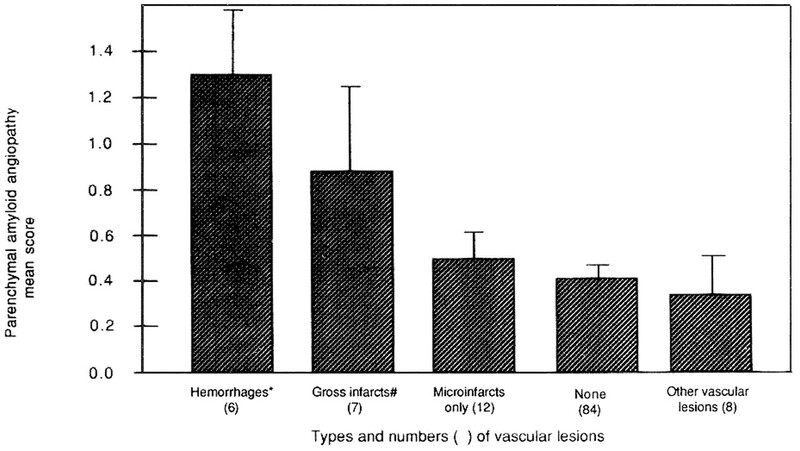 Figure 1 shows the mean overall CAA scores for the subjects with cerebral hemorrhages, gross infarcts, microinfarcts, and other types of vascular lesions. ANOVA showed a significant main effect of groups (F[4, 116] = 5.26; p < 0.0005). Post-hoc t-tests demonstrated significantly higher mean CAA scores for subjects with gross infarcts and hemorrhages than those with no vascular lesions. Although the degree of CAA in subjects with hemorrhages did not differ significantly from that in subjects with gross infarction, it was significantly greater than in subjects with microinfarction, or with no other lesions. Figure 1. Overall mean scores for cerebral angiopathy (showing standard error) as related to the presence of vascular lesions in the brain. * Significantly different from Microinfarcts, None, and Other; # significantly different from None. This prospective, standardized, clinical-neuropathologic study of CERAD patients with AD showed that 83% of them had evidence of CAA in the cortical or meningeal vessels. Previous studies reported a similar proportion of cases with vascular amyloid among patients with AD [2,4] but a much lower frequency (less than 50%) in elderly nondemented subjects. [24-26] The present study of AD also confirms previous studies [25,27] showing that the frequency of CAA is age dependent, with older subjects having more severe vascular amyloid deposits. About one-fourth of our subjects had CAA that was judged to be moderate to severe in at least one cortical region. Of the five regions studied, the most common site for CAA was midfrontal cortex, followed by inferior and superior temporal, entorhinal, and hippocampal cortices, in descending order of frequency. The principal finding in this study of AD was the correlation between greater severity of CAA and the presence of hemorrhages or ischemic lesions in the brain, which were present in 28% of 117 subjects. CAA scores were highest in brains showing cerebral hemorrhages and next highest in those with gross ischemic infarctions. Our findings confirm and extend those of other reports. [10-13,20] For example, Olichney et al. also found CAA to be significantly associated with cerebral infarctions in brains of patients with AD. The patients in their study differed from those in the present study, however, in that 18% had clinical diagnoses other than AD; 17 patients were believed to have vascular or mixed dementia. In addition, we examined the relationship of CAA to various types of vascular lesions. We found that CAA was associated with gross cortical infarcts and with hemorrhages but not with subcortical lacunes or microinfarcts, suggesting that vascular amyloid deposition may play a role in the pathogenesis of some but not all vascular lesions in AD. We found that higher levels of amyloid angiopathy correlated with atherosclerosis and arteriosclerosis in the cerebral vessels. Others also noted more severe CAA in brains with atherosclerotic disease. In the present study, moderate to severe CAA also tended to be associated with a higher frequency of hypertension. The observational nature of this study limits conclusions regarding the relative influence of the three factors (amyloid angiopathy, arteriosclerosis, or hypertension) in producing the hemorrhages or ischemic lesions found in the brains of our subjects. We speculate, however, that one of these factors may damage vessel walls and initiate or promote degeneration of smooth muscle cells. This, in turn, might enhance the subsequent deposition of amyloid in vessel walls. The exact relationship between CAA and the presence of hemorrhages or ischemic lesions in the brains of patients with AD is unknown. The severity of CAA appears to be greater in older patients and among those with hypertension and cerebral arteriosclerosis, suggesting that each of these conditions may interact to produce the cerebral ischemic lesions and hemorrhages frequently observed in AD. We thank Ron Thomas, PhD, for assistance with the statistical analyses performed here. Vinters HV, Gilbert JJ. Cerebral amyloid angiopathy: incidence and complications in the aging brain. II. The distribution of amyloid vascular changes. Stroke 1983;14:924-928. Itoh Y, Yamada M, Hayakawa M, Otomo E, Miyatake T. Subpial beta/A4 peptide deposits are closely associated with amyloid angiopathy in the elderly. Neurosci Lett 1993;155:144-147. Glenner GG, Henry JH, Fujihara S. Congophilic angiopathy in the pathogenesis of Alzheimer's degeneration. Ann Pathol 1981;1:120-129. Joachim CL, Morris JH, Selkoe DJ. Clinically diagnosed Alzheimer's disease: autopsy results in 150 cases. Ann Neurol 1988;24:50-56. Blondal H, Guomundssen G, Benedikz E, Johanesson G. Dementia in hereditary cystatin-c amyloidosis. Alzheimer Dis Assoc Disord 1988;2:170. Armstrong RA, Myers D, Smith CU. The ratio of diffuse to mature beta/A4 deposits in Alzheimer's disease varies in cases with and without congophilic angiopathy. Dementia 1993;4:251-255. Rozemuller AJ, Roos RA, Bots GT, et al. Distribution of beta/A4 protein and amyloid precursor protein in hereditary cerebral hemorrhage with amyloidosis Dutch type and Alzheimer's disease. Am J Pathol 1993;142:1449-1457. Lippa CF, Hamos JE, Smith TW, Pulaski SD, Drachman DA. Vascular amyloid deposition in Alzheimer's disease. Neither necessary nor sufficient for the local formation of plaques or tangles. Arch Neurol 1993;50:1088-1092. Zubenko GS, Stiffler S, Stabler S, et al. Association of the apolipoprotein E epsilon 4 allele with clinical subtypes of autopsy-confirmed Alzheimer's disease. Am J Med Genet 1994;54:199-205. Olichney JM, Hansen L, Hofstetter CR, et al. Cerebral infarction in Alzheimer's disease is associated with severe amyloid angiopathy and hypertension. Arch Neurol 1995;52:702-708. Ferreiro JA, Ansbacher LE, Vinters HV. Stroke related to cerebral amyloid angiopathy: the significance of systemic vascular disease. J Neurol 1989;236:267-272. Okazaki H, Reagan TJ, Campbell RJ. Clinicopathologic studies of primary cerebral amyloid angiopathy. Mayo Clin Proc 1979;54:22-31. Smith DB, Hitchcock M, Philpott PJ. Cerebral amyloid angiopathy presenting as transient ischemic attacks. Case report. J Neurosurg 1985;63:963-964. Lopez O, Claassen D, Boller F. Alzheimer's disease, cerebral amyloid angiopathy, and dementia of acute onset. Aging 1991;3:171-175. Corey-Bloom J, Galasko D, Hofstetter CR, Jackson JE, Thal LJ. Clinical features distinguishing large cohorts with possible AD, probable AD, and mixed dementia. J Am Geriatr Soc 1993;41:31-37. Aronson MK, Ooi WL, Geva DL, et al. Dementia. Age-dependent incidence, prevalence, and mortality in the old old. Arch Intern Med 1991;151:989-992. Mendez MF, Mastri AR, Sung JH, Frey W. Clinically diagnosed Alheimer disease: neuropathologic findings in 650 cases. Alzheimer Dis Assoc Disord 1992;6:35-43. Gilbert JJ, Vinters HV. Cerebral amyloid angiopathy: incidence and complications in the aging brain. I. Cerebral hemorrhage. Stroke 1983;14:915-923. Mandybur TI. Cerebral amyloid angiopathy: the vascular pathology and complications. J Neuropathol Exp Neurol 1986;45:79-90. Greenberg SM, Vonsattel JP, Stakes JW, Gruber M, Finkelstein SP. The clinical spectrum of cerebral amyloid angiopathy: presentations without lobar hemorrhage. Neurology 1993;43:2073-2079. Hendriks L, Van DC, Cras P, et al. Presenile dementia and cerebral haemorrhage linked to a mutation at codon 692 of the beta-amyloid precursor protein gene. Nature Genet 1992;1:218-221. Morris JC, Heyman A, Mohs RC, et al. The Consortium to Establish a Registry for Alzheimer's Disease (CERAD). Part I. Clinical and neurological assessment of Alzheimer's disease. Neurology 1989;39:1159-1165. Esiri MM, Wilcock GK. Cerebral amyloid angiopathy in dementia and old age. J Neurosurg Psychiatry 1986;49:1221-1226. Ishihara T, Takahashi M, Yokota T, et al. The significance of cerebral vascular amyloid in the aetiology of superficial (lobar) cerebral haemorrhage and its incidence in the elderly population. J Pathol 1991;165:229-234. Vonsattel JP, Myers RH, Hedley-White ET, et al. Cerebral amyloid angiopathy without and with cerebral hemorrhages: a comparative histological study. Ann Neurol 1991;30:637-649. Yamada M, Tsukagoshi H, Otomo E, Hayakawa M. Cerebral amyloid angiopathy in the aged. J Neurol 1987;234:371-376. Joachim CL, Duffy LK, Morris JH, Selkoe DJ. Protein chemical and immunocytochemical studies of meningovascular beta amyloid protein in Alzheimer's disease and normal aging. Brain Res 1988;474:100-111. Roher AE, Palmer KC, Yurewicz EC, Ball MJ, Greenberg BD. Morphological and biochemical analyses of amyloid plaque core proteins purified from Alzheimer disease brain tissue. J Neurochem 1993;61:1916-1926. Roher AE, Lowenson JD, Clarke S, et al. Beta-amyloid-(1-42) is a major component of cerebrovascular amyloid deposits: implications for the pathology of Alzheimer disease. Proc Natl Acad Sci USA 1993;90:10836-10840. Suzuki N, Iwatsubo T, Odaka A, Ishibashi Y, Kitada C, Ihara Y. High tissue content of soluble beta 1-40 is linked to cerebral amyloid angiopathy. Am J Pathol 1994;145:452-460. Wisniewski HM, Wegiel J. Beta-amyloid formation by myocytes of amyloid vessels. Acta Neuropathol 1994;87:233-241. Kawai M, Kalaria RN, Cras P, et al. Degeneration of vascular muscle cells in cerebral amyloid angiopathy of Alzheimer's disease. Brain Res 1993;63:142-146.